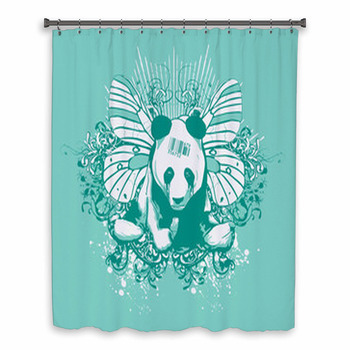 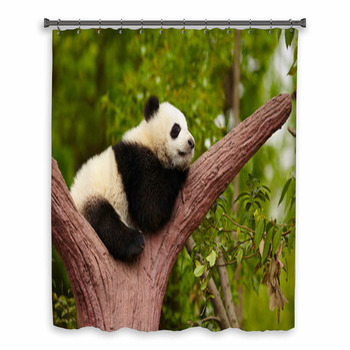 Huge but gentle, panda bears are one of the most beloved creatures in the world, so turn your bathroom into a panda bear sanctuary with our panda themed shower curtains, towels and bath mats. 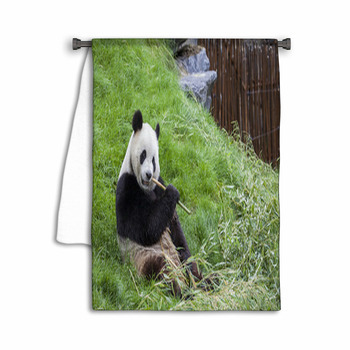 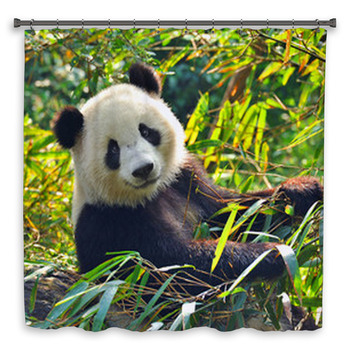 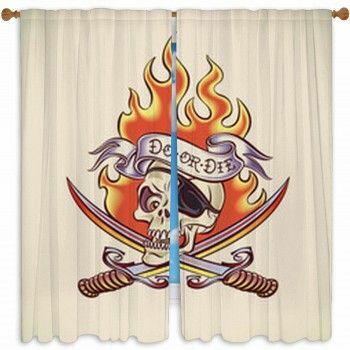 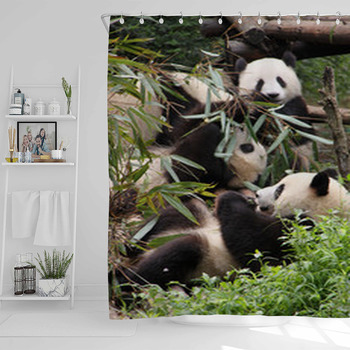 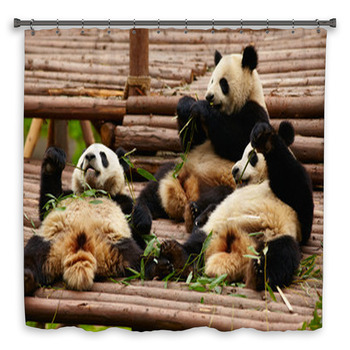 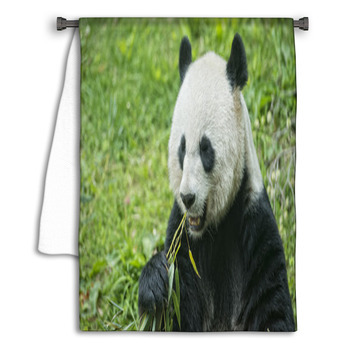 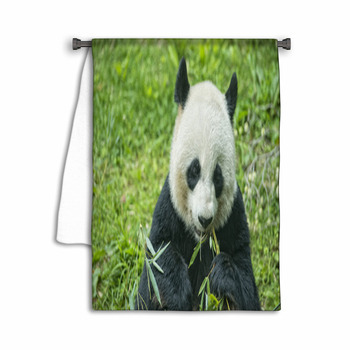 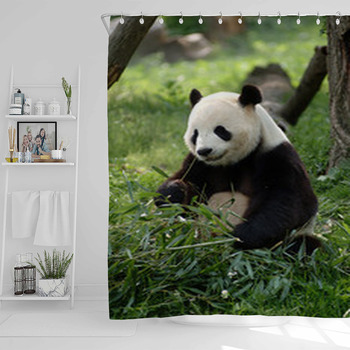 If you're a nature lover, choose custom shower curtains that capture a photo image of a baby panda climbing on a piece of wood and rope in a panda zoo habitat, a mother panda nuzzling her young baby's head as he rolls on his back and reaches playfully towards his mom's face, two grown pandas sitting around beneath a eucalyptus tree and enjoying lunch, an illustrated scene depicting a panda sitting on grey rocks and lifting himself up with bamboo stalks, or an old panda bear crouching by a tree and eating its favorite food, eucalyptus leaves. 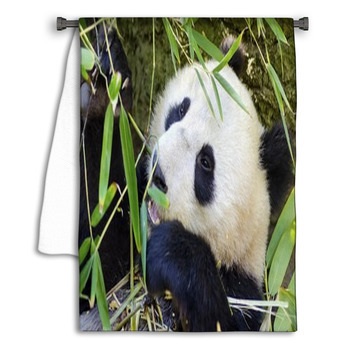 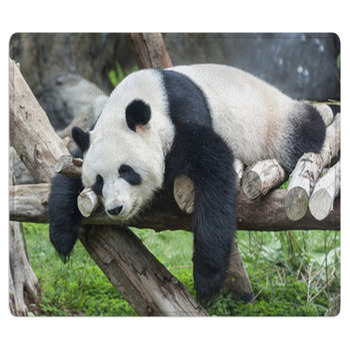 For a cute cartoon panda image on your towel or a gift for your kids, we have designs including a funny panda bear with pink paws and ears smiling as he holds a branch and leaves, a fuzzy young panda holding a purple and blue, lightning striped surfboard and waving, a sweet baby panda with huge blue and black eyes clinging to or sleeping on a branch, or a cute, simply drawn baby panda holding a little eucalyptus branch in a red background. 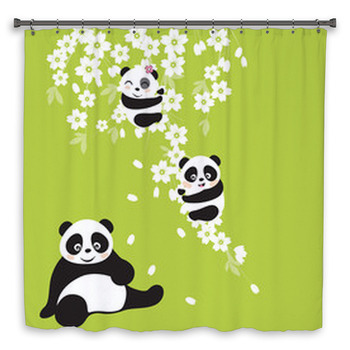 We also have panda shower curtains and bath mats of a doctor and nurse panda bear team, with the black eyed panda doctor wearing a light on his forehead, a stethoscope around his neck, a white doctor's frock, and a green and red bowtie, as he stands beside his green eyed panda nurse, who has red lips, a pink pearl necklace, a nurse's hat on her head and a syringe in her hand, with a sign on the grey wall that says Dr.Panda.